A technology being developed by Ford to help blind passengers virtually “see” the view outside a car’s windows only hints at the potential benefits of autonomous vehicles for the visually impaired. Ford’s “Feel the View” concept, shown in a video posted this week, uses an external camera to capture the scene outside and special LEDs embedded in a car window to represent it as a pattern of different vibrations. A blind passenger can feel the shape of what’s outside the car by touching the glass. Photos taken by a camera above the window are translated into grayscale images and then into 255 types of vibrations on different parts of the glass. The rider also hears a spoken description of the scene, generated through artificial intelligence. Ford of Italy is developing the technology in collaboration with Adeo, an Italian startup that specializes in innovations for blind children. The system can capture still images at high speed but does not use video, a Ford of Italy spokesman told The Connected Car. Using haptics, or touch, is a hot trend in representing visual information for the blind, said Anil Lewis, executive director of the Jernigan Institute, the research arm of the National Federation for the Blind. However, there are limitations to the car-centric approach Ford is taking with the “Feel the View” concept, he said. For a blind passenger, it might be better to do the same thing in a tablet with a camera instead of the car window, Lewis told The Connected Car. That way, passengers could point the camera wherever they wanted and “view” the images by touch in the privacy of the car, rather than having everyone outside see them touching the window, he said. “If they’re willing to invest that much into this, I think there’s another way to get a better impact,” he said. That said, there are countless unexplored possibilities to design AVs to better serve the blind — and the sighted, according to Lewis. “The beautiful thing about that is, we don’t know,” he said. The potential benefits are huge, because transportation options affect many aspects of life for people with disabilities, including where they can live, what jobs they can take, and where they can shop, University of Florida researcher Julian Brinkley noted. Brinkley is studying AV user interfaces for the blind, such as automated audio messages about what is nearby. The main idea in designing AVs to better accommodate the blind is to let riders interact with all of a car’s features without a visual interface, Lewis said. (Controls that work without sound, accommodating the deaf, should also be part of the mix, he added.) Vehicle designers may find new ways to do this as they break out of the traditional form of the automobile, with its driver’s controls and forward-facing seats, Lewis said. New control options will benefit everyone, he said. 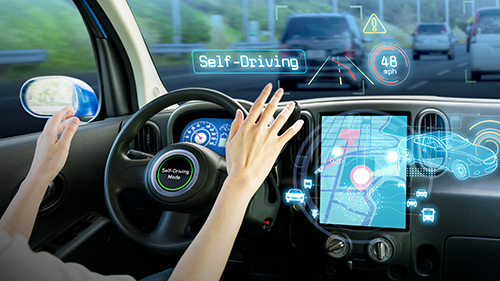 For example, people in driverless cars won’t have to look up from what they’re reading or watching to drive, so they may want to be able to control the air-conditioning by voice command rather than reaching for a button. “There’s a business case there,” Lewis said. “It’s going to be a better, more usable product.” The Jernigan Institute is eager to help automakers better design their cars for the blind, he said.